WASHINGTON — Hillary Clinton bested Donald Trump in three debates. She leads in many preference polls of the most competitive states. Barring a significant shift in the next two weeks, she is in a strong position to become the first woman elected U.S. president. But Clinton will end the campaign still struggling to change the minds of millions of voters who don’t think well of her, a glaring liability should the Democratic nominee move on to the White House. While many see her as better prepared to be commander in chief than Trump, she is consistently viewed unfavorably by more than half of the country. Most voters also consider her dishonest. Clinton’s advisers have spent months trying to erase that perception. They’ve set up small events where she had more intimate conversations with voters. They’ve tested a seemingly endless stream of messages aimed at assuring the public that the former secretary of state was in the race to do more than fulfill her own political ambitions. As Clinton starts making her closing argument to voters, her team appears to have come to terms that the mission remains unfulfilled. If Clinton wins, that theory may be proven true. Just 36 percent of voters believe Clinton is honest and trustworthy, according to a recent Washington Post/ABC News poll. That’s compared with about 60 percent who believe she has the qualifications and temperament to be commander in chief. The public’s perception of Clinton has bounced up and down throughout her time in public life. Her favorability rating fell below 50 percent at times during her years as first lady, but rose to its high water mark then and while she was as secretary of state under President Barack Obama. Democrats blame some of the current negative personal perceptions of Clinton on the hard-charging tactics she’s used to try to discredit Trump, though they believe her sustained assault on Trump’s character and temperament has been crucial. Party operatives also say Trump’s personal attacks on Clinton have made it all but impossible for more positive messages to break through. He’s called her a “liar,” a “nasty woman” and pledged to put her in jail. “When you’re under relentless assault from a reality TV star, it’s hard to come out of that with anybody feeling good about anyone,” said Bill Burton, a former Obama aide. Still, Clinton’s advisers acknowledge that some of her troubles have been of her own making, including her penchant for privacy. She’s spent nearly the entire campaign struggling to explain why she used a private email server in the basement of her home while she led the State Department. She hid a pneumonia diagnosis this fall from nearly all of her senior staff, then left the public unaware of her condition and whereabouts for 90 minutes after the illness caused her to rush out of a public event in New York. Clinton frequently shoots down questions about the public’s negative perceptions by saying she’s viewed more positively when she’s doing a job rather than running for one. There’s some evidence to back that up. When she ran for re-election to the Senate from New York in 2006, she won with 67 percent of the vote, a big jump from the 55 percent share from her first race in 2000. Her approval rating when she left the State Department, where her job kept her out of day-to-day politics, sat at an enviable 65 percent, according to the Pew Research Center. But if Clinton is elected president, she won’t have the luxury she had as secretary of state to stay away from the political fray — with Republicans in Washington in the opposition, and possibly Trump, too. The businessman keeps flirting with the idea he could contest the election results if he loses. There are also persistent rumors that, if he is loses, he might try to harness the enthusiasm of his millions of supporters into some type of media venture. 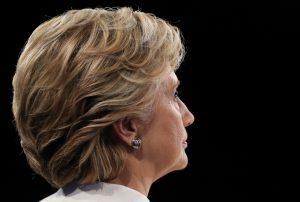 Clinton has begun acknowledging the challenge that could await her in the White House, if she wins, centering her closing argument to voters on a call for unity after a bitter campaign. “My name may be on the ballot, but the question really is who are we as a country, what are our values, what kind of a future do we want to create together,” she said Friday at a rally in Ohio. Some Democrats see the transition — the two month-plus stretch between the Nov. 8 election and the Jan. 20 inauguration — as a crucial opportunity for her to signal, if she wins, that a Clinton White House would be different from a Clinton campaign. In a nod to bipartisanship, she could nominate a Republican for her Cabinet. Clinton could start moving on some of her more broadly popular policy proposals as a way of boosting her appeal, assuming no crisis demands immediate action. “There’s no silver bullet to turn around years of wear and tear on her image,” he said.